Food art photography: until very recently this was not a term many people would have given much consideration to. Food was food, art was art. And photography was mostly something else too for that matter. How quickly things change: today the statement that food photography has never been so popular as it is now might seem like something of a truism. Especially given that photography in general has never been so popular as it is right now. But it’s easy to forget that, even just a few years ago, the idea that a large portion of the world’s population might regularly point a camera at their meal and display the result to the rest of the planet would have likely struck us as absurd. Unthinkable even. And yet this is precisely where we find ourselves. The reasons for this development are no doubt complex. They include our changing relationship with food just as much as our changing relationship with photography: for example the technological advancements that have made it possible for us to walk around with a camera in our pockets 24/7. Susan Bright‘s book, Feast for the Eyes, recently published by Aperture, attempts to go some way towards documenting this shift over time. It’s important to note that this is not a book about “food photography” per se. 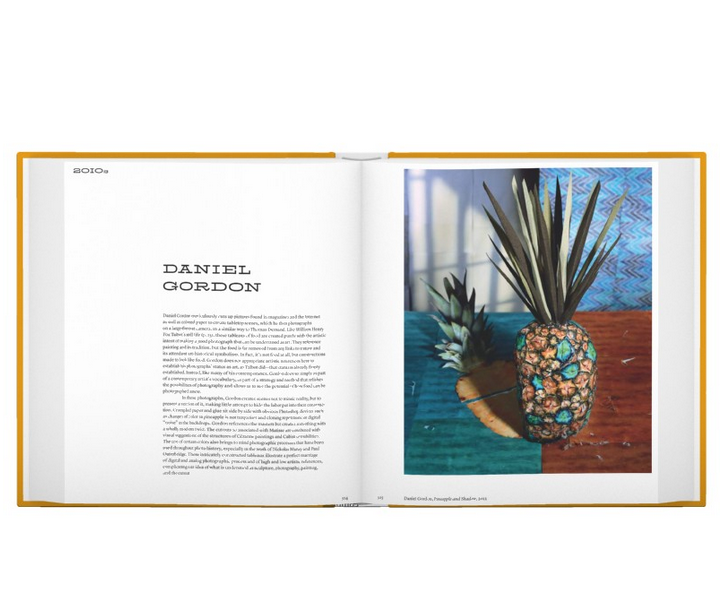 While some of the examples Bright includes are drawn from food advertising, old cookbooks, or early commercial food photography, the book largely features images by photographers working in the fine art or documentary sectors. There’s even a bit of fashion photography. Bright traces our relationship with food, as viewed through the camera lens, from a Fox Talbot still-life shortly after the medium’s invention, right up to the present day. On the way, the book touches upon Roger Fenton (who took time out from photographing the valley of death in the Crimean War to produce a few polite shots of fruit), Edward Weston, Weegee, Stephen Shore’s banal diner shots, Martin Parr’s quintessentially English culinary offerings, and a whole host of much artier image makers. Of this latter kind, you’ll find everyone from Sarah Lucas, Vik Muniz and Sophie Calle to Cindy Sherman. As Aperture editor Denise Wolff says, when we photograph food “it’s not just about food, it’s about something larger”. 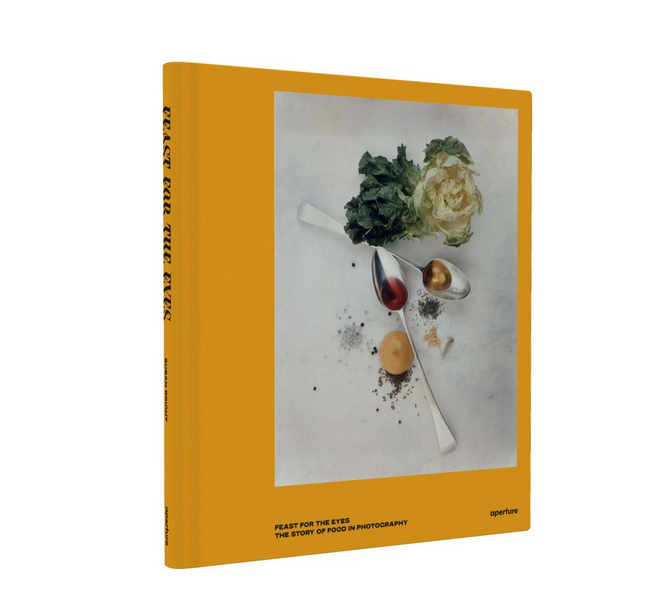 And the book approaches the subject of food art photography largely from of an anthropological perspective: examining the ritual, social and political aspects of depicting food by photographic means. Indeed, while the photographs included in the book do indeed depict food in some form, and are undeniably linked by this theme, in many cases they are not actually about the food itself. And unfortunately there’s something a little unsatisfying about this premise. It’s just too broad, and the themes that photographs of food (as opposed to food photography) might potentially touch upon are just too disparate. Although Feast for the Eyes makes for an interesting and, at times, thought-provoking collection, ultimately the result is not dissimilar to that which might have occurred if, rather than focusing on food, Bright had instead chosen to publish a book of photographs linked by the fact that they all depict people. 200+ photos of people would of course tell us something about people – or about the photographers’ relationships with other people. But if the images included were drawn from as many diverse genres as they are in this book, the result might be somewhat superficial, if not downright confusing. Clearly, though, Bright had no intention to present this as a definitive and all encompassing survey of the subject of food in photography, but rather as an introduction to a topic that has largely been ignored in “serious” photography circles until now. Still, the inclusion of photographs such as Susan Meiselas’s documentary images of the Nicaraguan civil war, purely on the grounds that they depict soldiers eating, feels tenuous at best. If conflict photography shows us something valuable about the world, it’s likely not the banal observation that even troops need to eat. To sum up then, this is a book containing photographs of food. It’s not however a book of food photography. This doesn’t of course make it any less interesting, and the curious will find plenty here to stimulate and inspire. However, some readers will likely be left wondering as to the practical value of grouping together such an assorted selection of images under so broad a theme.